Throughout labor, your baby’s heartbeat and your contractions will be monitored to make sure that your labor is progressing as it should be and that the well-being of you and your baby is not threatened. Your baby’s heart rate is an indication of how well your baby is dealing with labor and it is monitored at regular intervals, called intermittent monitoring. If a problem is found or you have a high-risk pregnancy, then you may be advised to have fetal electronic monitoring, in which your baby’s heart rate and your contractions are monitored continuously by a electronic fetal heart monitor . All the information about your labor is recorded on a chart, called a labor graph. A handheld device can monitor your baby’s heartbeat at intervals, leaving you free to move around during labor. This is done using a handheld battery-operated device known as a Doppler sonicaid, which is held against your abdomen to listen to your baby’s heartbeat. When you are pushing in the second stage of labor, the fetal heart needs to be monitored more frequently. In this type of fetal monitoring, two devices monitor your baby’s heart rate and the strength and frequency of your contractions. Your baby’s heart rate is monitored with a circular ultrasound-like device. If you want, you can hear the heartbeat, or ask that the volume be turned down if this is distracting. Your contractions are monitored with a small plastic circular device. One or two elastic belts are placed around your abdomen to secure the monitors. You should be able to stand, sit, or squat with the monitors in place, and some hospitals have monitors that allow you to walk around and be monitored by radio signal. If your baby’s heart-rate reading indicates the baby is distressed or the signal from an electronic monitor is poor, the doctor may suggest internal fetal monitoring. In this technique, a small electrode is attached to the baby’s scalp and detects the electrical impulses of his heart. 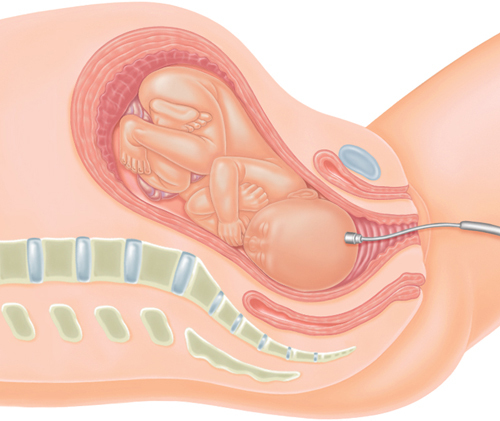 A wire from the electrode comes out via the cervix and attaches to the EFM machine (see External fetal monitoring). You still wear a strap around your abdomen, which holds the device for detecting the rate and strength of your contractions. The electrode is placed during a vaginal examination and is no more uncomfortable than this. Placing a scalp electrode may be mildly uncomfortable for your baby and there is a small risk that your baby could get a scalp infection, which can be treated with antibiotics. Even though these risks are small, a scalp electrode should not be placed routinely. Your doctor should discuss how it works before it is placed, and you should understand why it’s being done. Electrodes should also be avoided if you have a viral disease that can be transmitted to your baby during labor, such as hepatitis B or C, or HIV. Once a scalp electrode has been placed, you can’t move far from the monitor, although you may be able to change position. If a EFM reading from the scalp electrode indicates that your baby is distressed, a blood sample may be taken from the scalp to check acidity levels. If these are high, a cesarean or assisted delivery may be suggested. A labor graph is a large chart that contains several graphs which provide information on your labor, allowing the doctor to monitor the progress of your labor. One of the most useful tools in this chart is a graph showing your labor curve. This plots cervical change and the position of your baby’s head in relation to your pelvis over time. The graph enables the doctor to establish when your labor became active. Also recorded with your baby’s heart-rate monitoring are your blood pressure, pulse, temperature, and the rate of your contractions, as well as your pain levels. The baby’s heartbeat and the strength and frequency of your contractions are measured by devices strapped to your abdomen with wires that connect to a machine that produces a printout of the readings and an ongoing digital log on the computer. 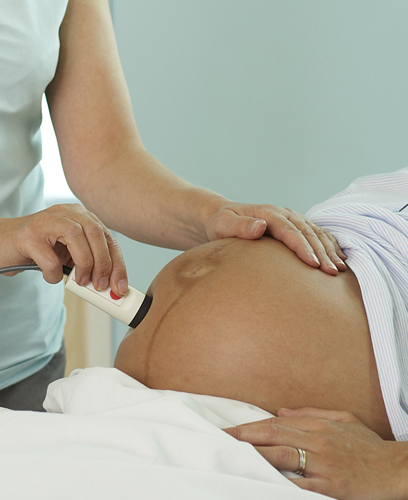 Your baby’s heartbeat is recorded against a baseline measurement of 120 beats per minute. The heart rate rises and falls naturally with contractions; unusual variations can indicate fetal distress. A separate reading records the strength and duration of each contraction. This can detect weakening contractions and can be useful with an epidural when you’re unable to feel contractions. Continuous monitoring of your baby’s heart rate and your contractions is done by means of monitors strapped to your abdomen. If there are concerns about the baby’s heartbeat, a small electrode attached to the scalp can give a more precise reading than external electronic fetal monitoring The electrode is passed through the cervix and attached to the head. Studies suggest that women who are monitored continuously are more likely to have a cesarean section or an assisted delivery with forceps or vacuum . This is because your doctor may see changes in the fetal heart rate that concern her. Some changes, such as a faster heart rate (more than 160 beats a minute), known as tachycardia, or decreases in the heart rate that occur after your contractions, can be caused by decreased oxygen to your baby. If your doctor sees these changes, she may be unable to determine if they were caused by low oxygen or if your baby is actually fine. If it’s thought that your baby may be at risk, an emergency cesarean section may be recommended. If there are fetal heart rate changes while you are pushing, a forceps or vacuum delivery may be offered. 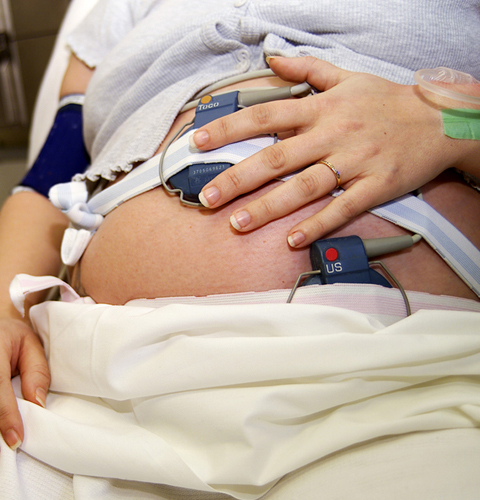 The benefits of continuous electronic fetal monitoring are not entirely clear. You are able to hear your baby’s heartbeat and some women may find this comforting. Also, experts agree that continuous monitoring reduces the chance that your baby will have a seizure after the birth, a symptom of brain injury from low oxygen. Seizures are rare, occurring in around 2.5 per 1000 births with monitoring and 5 per 1000 births without monitoring. It is harder to prove that electronic fetal monitoring can prevent rarer complications such as cerebral palsy or fetal death.